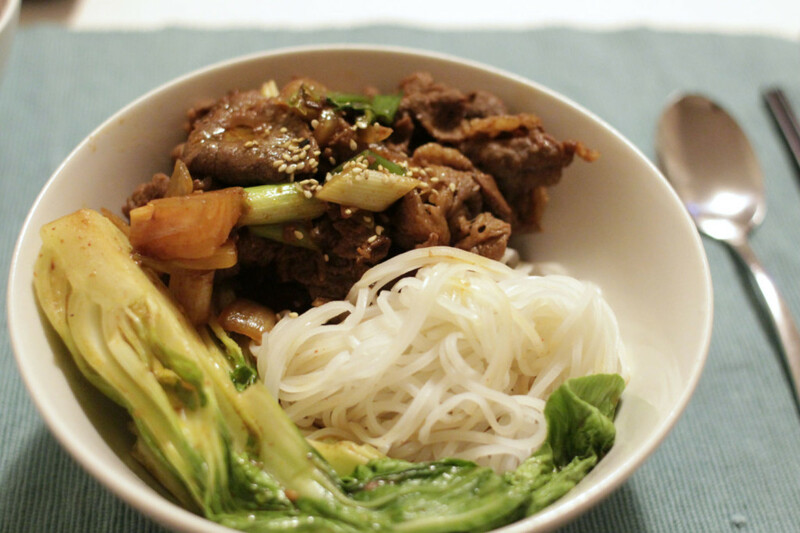 Our dinner tonight is Bulgogi with bok-choy and rice noodles, and wild rice pudding for dessert. Bulgogi is a popular Korean dish, grilled marinated thin beef. I normally marinade the meat overnight in soy sauce, cooking wine, garlic, ginger, onions, chili and sesame oil. When you cook the meat, make sure the pan is nice and hot and don’t crowd the pan otherwise you are stewing, not stir-frying. Add salt and pepper at the end. It is thinly sliced rib-eye or sirloin steak so you don’t need to cook for too long. It is yummy on rice or noodles with veggies on the side. Then we had wild rice pudding with tropical fruits for desserts, which I liked more than the main. I don’t normally like rice pudding as a dessert, but this one is different. Wild rice or forbidden rice has a beautiful purple colour when cooked, releases a nutty perfume and gives a nice bite when you chew. It is so divine and delicious! 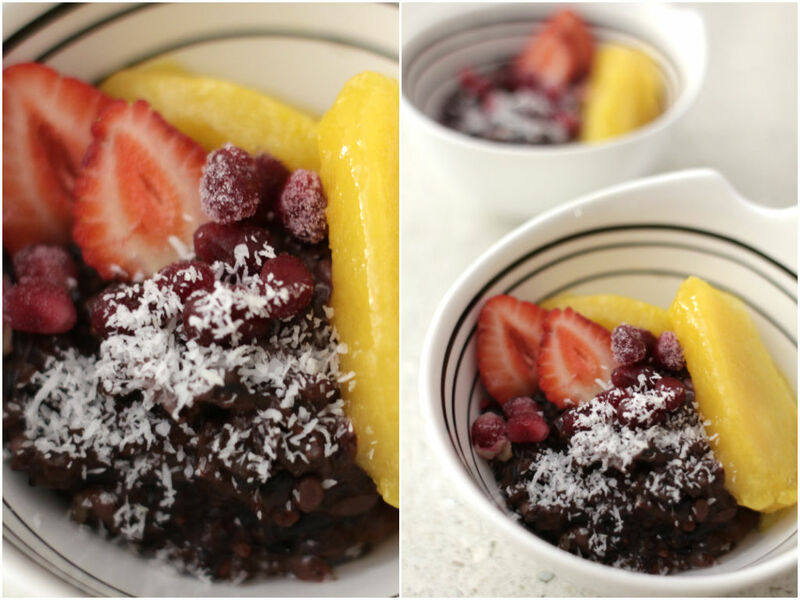 You can add any kind of fruits on top. Bananas, caramelised pear, blueberries, passion fruit, you name it. You can also serve this for breakfast, yum! You wouldn’t be able to skip this kind of breakfast, would you? If you are not into coconut milk, use non-dairy milk such as oat milk, almond milk or soy milk. Feel free to change the recipe depending on your taste. Rinse and soak the rice for overnight or a few hours to shorten the cooking time. Add coconut milk, vanilla powder, cacao powder and a pinch of salt into the pot and bring it up to boil. Simmer for 30 minutes or until the rice is tender. Stir frequently and add more coconut milk if needed. Add maple syrup at the end. Take it off the heat and pour into the bowl. Top with your favorite fruits and serve either hot or cold.